The cottage is situated in the centre of Kintail, at the head of the tidal waters of Loch Duich so that the spring high tides enter the bottom of the garden. A causeway carries the main A87 road to Kyle of Lochalsh (20 kms away) across Loch Duich on the seaward side of the cottage, leaving the former main road as a peaceful lane to the crofting hamlet of Carn Gorm (OS map No 33 [1:50,000 series] 'Lochalsh & Glenshiel' ref 956208). Kintail is on the 'Road to the Isles', where the Atlantic ocean washes the base of some of the oldest mountains in the world. Kintail is easily accessed by main roads from Fort William (A82 & A87) and Inverness (A82 & A887). 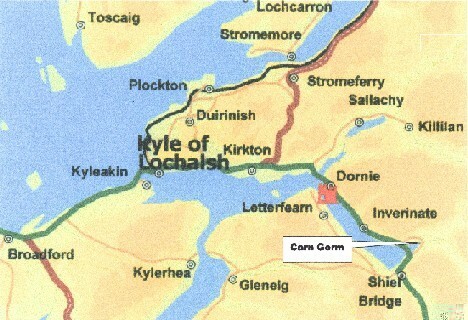 Four trains each day run into Kyle of Lochalsh (20 km) from Inverness. There are twice daily buses to and from each of Glasgow and Edinburgh and three times daily to and from Inverness; the bus stop is 1km from the cottage. The nearest Airport is Inverness (110 km) served by the low cost airline easyJet from Luton, Stansted and Bristol as well as other airlines including flybe; cars can be hired at the airport or in Inverness.